This album beautifully captures Iverson's prodigious intelligence, musicality, passion, and jazzy chutzpah. There's a wonderful translucence in many of the cuts on this album; melodic, harmonic and rhythmic layers are so clearly revealed on one surface, only to be mesmerizingly obfuscated on the next. You think you know where you are until you're suddenly swirling in unfamiliar though wonderously dark terrain. 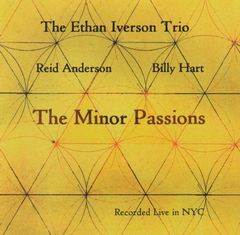 In "Lullaby", for example, Billy Hart's low rumbles, Reid Anderson's vicious, subtle plucks, and Iverson's piano lines weave in and out of one another, both independent and wholly cohesive, light and dark in texture, compositionally terse on the surface, but resonant with enormous structural and emotional depth. It's just stunning. Iverson uses dramatic contrasts with the touch of a master (catch him live if you can), but he's also not afraid to smash or caress contradictory elements together in the same musical space. In the same instant, we hear anger and tenderness, brightness and brooding, the cerebral and the soulful. Iverson reminds us, as only the best artists do, that great music has the universal realms of experience and consciousness within its grasp: it's all in here, not in a "look at me, look at me" kind of way, but in a "here's my vast world, I think it's probably yours too" kind of way. "Blues for a Groundskeeper" has enough jaunty nobility, love, life, swing, and just plain great music to make up for all of the nonsense that comes out these days. If you thought your tear ducts were rusty, listen to Iverson's rendering of "Where or When": it has a just-right nostalgia, an exotic lyrical grace, a meandering intellectual curiousity and a passionate but eery glow that is one of Iverson's trademarks. Everything's right on this album. There are no hesitations, no misfires. "Neon", the penultimate cut, is so sure and confident in its power, dramatic intensity and poise that it could only come from Iverson, whose artistry and musicality are as rigorous as his complex mind. This album forms an essential part of any (not only jazz) collection. It is one of the most completely refreshing releases I've heard in a long time.